Hi, I am interested in your 1986 Honda Gold Wing (stock #B2320 L) listed on Autotrader for $4,900. I'd like to get more information about this vehicle and confirm its availability. 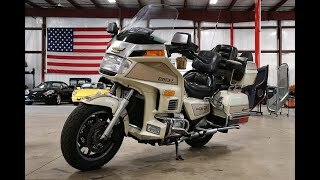 GR Auto Gallery is pleased to present for your consideration this 1986 Honda Goldwing Aspencade se-I for your consideration. This cool vintage cruiser runs remarkably well and is set up to cruise. It is powered by a 1200cc 4 cylinder with a 4 speed gearbox. The current owner has had it for the last 4 years and brought it up from Kentucky. The bike has a lot of storage space providing plenty of room for your road trip. Highlights include foot pedals/highway pedals, new windshield, air suspension, cassette player, Dolby sound system, twin front disc brakes, trailer hitch and mud flap, cup holder, Computerized Fuel Injection and more.